software also provides peace of mind through security improvements, always-on Cloud Backup of patient images, and the ability to access images from anywhere through CloudVu. DEXIS, LLC, a brand of the KaVo Kerr Group, announced its latest software release – DEXIS™ Eleven. Customers will benefit from a range of workflow improvements, including drag-and-drop tooth numbering, enhanced security, and fewer clicks for case presentation. Building on the solid foundation of DEXIS Imaging Suite, DEXIS Eleven helps dental practices in and out of the operatory. 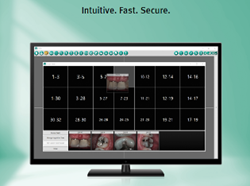 In the operatory, DEXIS simplifies your tooth numbering and reduces the number of clicks required for case presentation and common workflows. The software also provides peace of mind through security improvements, always-on Cloud Backup of patient images, and the ability to access images from anywhere through CloudVu. The tooth number dialogue allows the user to assign tooth numbers using drag-and-drop functionality. With this new feature, the user can easily move imported and intra-oral camera images into predefined tooth number bins. Users retain the ability to assign a specific tooth number if needed. The new History View feature sorts and displays patient images by date to allow for a faster search when viewing past images. DEXIS Core is the single, centralized location used by DEXIS Eleven to store patient images and allows easy access to those images. DEXIS Core also powers a new collection of online tools beginning with Cloud Backup of patient images and CloudVu for remote access of patient images. HIPAA-level image storage continues to be top-of-mind for many dentists. DEXIS Eleven provides users with the ability to create log-ins for each user and access audit data on user activity. When backing up patient images, the Cloud Backup feature allows for cloud storage of patient data that is encrypted on its way to the cloud and encrypted when it is stored. With additional audit tracking, redundancy and temperature-controlled server environments, Cloud Backup gives you peace of mind that your patient data is secure. Once stored in the cloud, DEXIS Eleven software users can add CloudVu, which enables access to patient images from anywhere. This intuitive web-based extension of DEXIS allows the user to view and edit patient images at any time, from any location and see any changes in DEXIS Eleven. DEXIS CloudVu requires a Chrome browser on a desktop or laptop. DEXIS Eleven with CloudVu allows users to view patient images from almost any location. The refreshed look and feel remains consistent with earlier versions of the DEXIS, which means users will interact with familiar tools and functionality. Existing DEXIS users can upgrade quickly while their patient images migrate in the background. To experience DEXIS Eleven’s workflow improvements, enhanced security, and new Cloud Backup and CloudVu features, current DEXIS owners can visit http://www.dexis.com/upgrade to schedule their upgrade to DEXIS Eleven. DEXIS products are available exclusively through Henry Schein, Inc., the world's largest provider of health care products and services to office-based dental, animal health and medical practitioners. In addition, DEXIS maintains seamless integration between its digital imaging and Dentrix® practice management software, owned by Henry Schein, with DEXIS Integrator™ for Dentrix. For DEXIS indications for use, visit http://www.dexis.com/ifu. DEXIS is an industry leader in developing high quality digital imaging solutions for the dental community. In 1997, DEXIS introduced digital radiography on laptop computers — making it the first truly portable and affordable digital X-ray system. In 2001, DEXIS™ became the first intra-oral digital radiography system to be accepted by the American Dental Association into the highly prestigious ADA Seal Program. Today, DEXIS is the most highly awarded intra-oral digital X-ray system with numerous awards from dental researchers and well-respected dental publications. For more information on the DEXIS Imaging Suite of products including the DEXIS™ Platinum Sensor and CariVu™, visit http://www.dexis.com. DEXIS is a member of the KaVo Kerr Group. KaVo Kerr Group is a global portfolio of leading dental brands that share common values of Trust, Experience, Choices, Quality and Smart Innovation. Brands include KaVo™, Kerr™, Kerr Total Care™, Pentron™, Axis|Sybron™ Endo, Orascoptic™, Pelton & Crane™, Marus™, Gendex™, DEXIS™, Instrumentarium™, SOREDEX™, i-CAT™, NOMAD™, Implant Direct™ and Ormco™. With over 500 years of combined experience and proven solutions, KaVo Kerr Group uniquely serves 99% of all dental practices. Visit http://www.kavokerrgroup.com for more information.